It is fascinating how the most innocuous of things are most often life’s most fateful determinants. It seems unjust, if not ridiculous, that whether or not someone wrote eight letters to spell out the word Rhodesia, would result in whether you went on to have a successful marriage to a ‘mensch’ in Salisbury, or was sent to an Auswitch gas chamber. Yet it was this very act of omission on the part of Santa Pelham’s rival for the hand of her unseen future husband that resulted in her written acceptance of his marriage proposal getting to him at the same time as her rival’s – which was posted much earlier – that forced him to make a choice he otherwise would not have considered. Had the other letter not been delayed by first going to every other country in which there was a town named Salisbury, we would not be watching Santa’s Story. Santa would have remained in France and she, like her parents and brother, would have been exterminated by the Nazis. On such flimsy chance fate turns. One would also think that with material such as this, and a story that traverses Germany, Poland, Spain, France and Rhodesia, you’d have a cracker of a play. Unfortunately not. It is a fascinating tale but one not particularly well told. Which is a pity because a story like this should amount to more than a history lesson told in the first person with musical interludes. Listing the various European countries by name in the programme and then referring to ‘Africa’ rather than Rhodesia, doesn’t help perceptions. 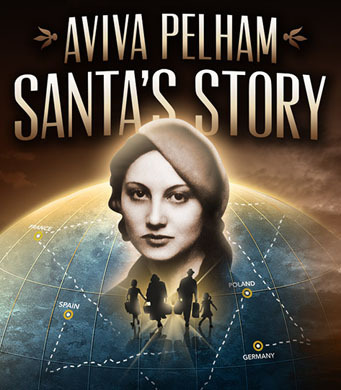 Though Aviva Pelham, who is the daughter of Santa Pelham (who was also in the audience on opening night despite her 95 years), has a wonderful voice and does a creditable job of telling her mother’s story, she remained an orator and failed to transcend the fact that she was a person on a stage. I was more drawn to the projected photographs of the real Santa Pelham during her youth. Through those black and white images the complexity of security and inner self-confidence borne of being raised in a loving family, countered with the insecurity and anxiety created by senseless oppression and life-threatening politics, is captured in the most haunting and conflicting expressions timelessly captured on the face of a beautiful young woman. And though Aviva is the daughter of the woman we see in those projections, the gap was not bridged, reinforcing the petty reality of current circumstances rather than transporting me to another time and place. The formulaic rhythm of the play may also have played its part. Monologue – song – change hat, monologue – song – change coat, monologue – song – remove coat, etc. I’m not sure what I expected from distinguished director Janice Honeyman, but the lack of imagination sure did surprise me, the pace and style so stale that I at times I had to remind myself that, according to the words I was hearing, I was being told of a scene so poignant that were it fictional it would be accused of being maudlin. Yet here all elements conspired to flatten such scenes out into the theatrical equivalent of a yeast-free crumpet. It made so little sense that I’m quite prepared to accept that there may be some point, or concept, which I completely failed to grasp. Yet despite my heavy-handed criticism, this is a story which is so compelling, that even if it is simply viewed as oral history – which is rare enough in itself – it is worth seeing. Santa’s Story runs at The Fugard Theatre, Cape Town, until 26 May.